Met Eireann has forecast a very wet conditions across the country today. Spells of rain, heavy in many places, but especially Atlantic coastal areas are forecast with some flooding locally. Latest forecasts from Met Eireann also suggests that conditions will remain unsettled over the next few days. Rainfall Warning for Donegal, Galway, Mayo and Sligo. There will be spells of heavy rain during Saturday, through Saturday night and on Sunday. Accumulations of 40 to 60mm are expected generally. But 60 to 80mm are possible on hills and mountains. Rainfall Warning for Longford, Louth, Wicklow, Meath, Cavan, Monaghan, Leitrim and Roscommon. There will be spells of heavy rain on Saturday, Saturday night and for a time on Sunday. Accumulations of 25 to 35mm are expected. But 40 to 45 mm are possible on hills and mountains. Rainfall Warning for Clare, Cork, Kerry and Limerick. There will be spells of heavy rain on Saturday, Saturday night and for a time on Sunday. Accumulations of 25 to 35mm are expected generally, but 40 to 45 mm are possible on hills and mountains. 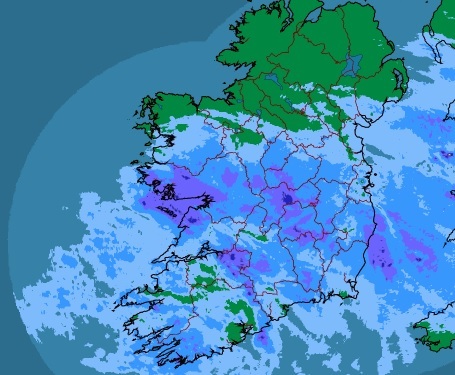 Met Eireann says the rain will become more scattered in southern parts of Munster and Leinster later in the day. It will be windy, but mild tonight, with further rain in many areas, according to Met Eireann. It says it will be heaviest over parts of Ulster and Connacht, with ongoing risk of flooding. Some dry spells in eastern areas, but generally cloudy and misty, with further rain at times. Some of this heavy in the west and northwest of the country. Met Eireann says next week will be very unsettled, with rain most days. Some windy spells too. It says temperatures will fluctuate too, but there will be some mild conditions at times.